Scandinavian countries have been using underfloor heating since the 1920's, now over 100,000 homes per year are fitting underfloor heating and it is now available in the UK to the DIY market. We are most comfortable when a high proportion of the warmth we feel is radiant, with our heads slightly cooler than our feet. It is nature's way. An underfloor heating system closely matches this idea. The absence of radiators gives extra space and freedom to design your rooms as you want. Our electric underfloor heating systems can be used in any room, but are extremely popular in conservatories, bathrooms and kitchens. In most cases our systems can be used as the main sole source of room heating. Alternatively they can be used as comfort warming - taking the chill off cold floors. Bathrooms Sometimes limited wall space and regulations on which heaters can be fitted in bathrooms can be a problem. Installing underfloor heating eliminates both problems and creates a warm floor that will be a pleasure to step out of the bath or shower on to. 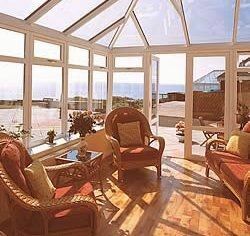 Conservatories With low dwarf walls, and very little room to spare on the existing house walls underfloor heating is ideal. Transform your conservatory into a room that can be used all year round with a warm inviting environment, whilst retaining the benefits of tiles or laminates. Kitchens Come down in the morning to a welcoming warm tiled or laminate floor. Leaving your walls free for more units, thus more storage space to utilise. Q: Can the heating mats be fitted to screeded sub-floors? A: Yes, but newly laid floors must have dried out fully (4-6 weeks minimum). Insulation of the sub- floor should also be considered, as this can enhance the heating performance significantly. Q: Should I use self levelling compound, and if so what depth is required on top of the mats? A: The use of self levelling compound is only necessary if the mats are to be laid under carpet, wood or laminate floors. In these cases the depth of self levelling compound should be 3-5mm above the mats, i.e. 6-8mm in total. 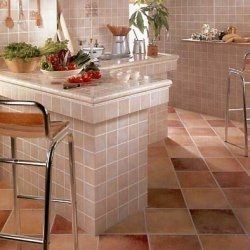 If ceramic tiles are to be used, the mats can be laid directly in the ceramic tile adhesive. Q: Can I use more than one heating mat in a room? A: Yes, but they must be connected in parallel, or each controlled by its own separate controller. If more than one mat is being controlled by one controller, it will be necessary to connect the mats to the controller via a junction box. Q: What sort of wiring is required? A: Areas up to 20 square metres can usually be supplied direct from a 13 Amp- fused spur. The circuit should be protected by an RCD.